A HERCULEAN performance from Bryce Gibbs has spearheaded Carlton to a 10-point win over Gold Coast at Metricon Stadium and kept its unlikely finals hopes flickering. The Blues led by 29 points early in the third term, relinquished the lead during the fourth, but then steadied to win 12.11 (83) to 11.7 (73). The victory is their second in succession and moves them to a 5-7 win-loss record. On a dirty night for the Suns, Michael Barlow was stretchered off halfway through the final quarter after suffering a broken leg. Gibbs was a colossus, finishing with 43 disposals and two crucial goals in the fourth term when the heat was on. His first was a set shot from 50m, and the second a brilliant baulk around Pearce Hanley and finish from 40m after his side had fallen behind. Gibbs' second goal would put the Blues in front for the final time, before Jack Silvagni and Jed Lamb iced the job with the next two goals. Carlton coach Brendon Bolton said Gibbs was so good, he'd break his own rule of not individualising in his post-match press conference. "On this occasion, I think it would be remiss of me not to mention Bryce's game," Bolton said. "He had 43 touches, kicked a couple of goals, but more importantly, the stat to look at, he had 10 tackles, because we want to be defined by pressure." Gibbs had plenty of help though as Kade Simpson (33), Marc Murphy (31) and Sam Docherty (30) were also prolific. Ed Curnow (21 touches) waged an enthralling duel with Suns superstar Gary Ablett (25) and had the better of the contest, while reborn defender Liam Jones completely blanketed Suns co-captain Tom Lynch. Lynch kicked seven goals when the teams met earlier this season, but Jones kept him goalless this time and restricted him to just 10 disposals and one mark. Carlton thoroughly deserved its win after absolutely dominating the first half. It should have been more than 24 points in front at the main break, but poor kicking for goal kept the home team in it. The loss is not a disaster for Gold Coast, but it's not far short after successive wins had put them right in the finals picture. "It was very poor, wasn't it?" Gold Coast coach Rodney Eade said. "It's still a learning curve for us and we have to find the solution, we just have to get consistency." Jack Martin kicked three goals and Jarryd Lyons two as the Suns midfield was outplayed. Carlton set the physical tone right from the opening bounce. Curnow pushed, bumped, whacked and harassed Ablett any chance he got – as did every Blues player that came within striking distance of the Suns champion. Their midfield decimated Gold Coast's in the first two quarters. Carlton led the disposals (227-138) and inside 50s (32-13) and just some wayward kicking in front of goal gave the Suns a slight sniff they didn't deserve. Gold Coast: Flying defender Adam Saad copped a big bump from Dale Thomas just before half-time that looked to catch him high. Saad hit the deck immediately and struggled to leave the field. He returned after the main break and played the game out. Veteran midfielder Michael Barlow will undergo surgery on Sunday after suffering a broken leg midway through the final quarter. 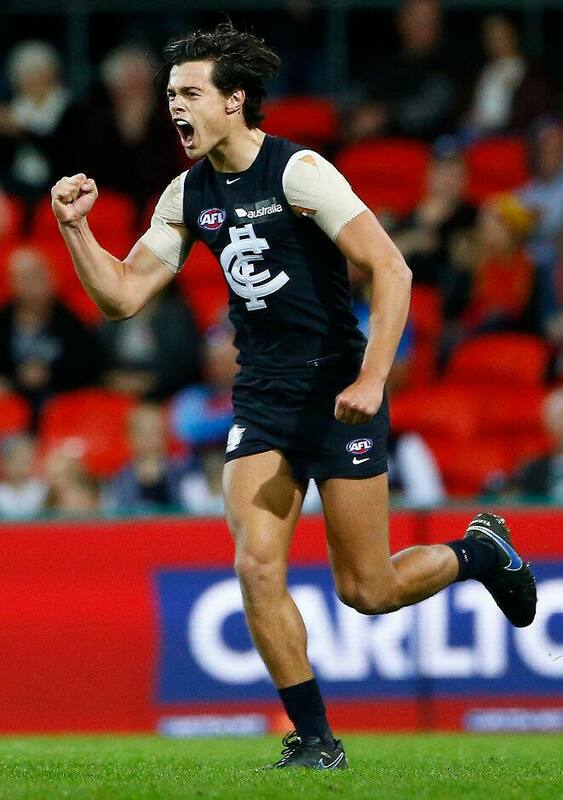 Carlton: The Blues seemed to get through unscathed. The Blues will try to make it three-in-a-row next Sunday in what shapes as a huge match against Richmond at the MCG. Gold Coast has its own big battle to play at Etihad Stadium, taking on St Kilda in what will be Gary Ablett's 300th game.